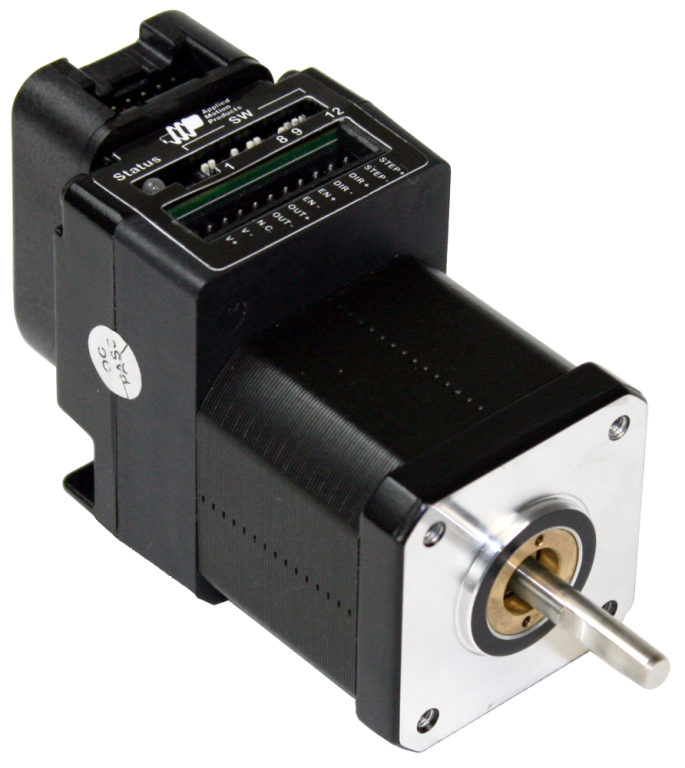 The STM17R-3NE integrated stepper is a drive+motor unit, fusing a NEMA 17 step motor and a sophisticated 2.0 A/phase (peak-of-sine) stepper drive into a single device. Power to the drive, located at the rear of the motor, must be supplied by an external DC supply. See Related and Recommended Products below for compatible 24 and 48 volt DC power supplies. The STM17R-3NE is designed for step & direction control from an external controller. The external controller can be a motion controller, PLC, or other device that provides two digital outputs: one output for digital pulses to control position and velocity of the motor, and a second output to control the direction of the motor, CW and CCW. Some controllers provide two pulse outputs – referred to as CW/CCW pulse or pulse-pulse – instead of pulse & direction. The STM17R works with these controllers as well simply by changing one of the setup dip switches. Note that STM17R integrated steppers are not available with any communication options (such as Ethernet, RS-485, etc.) or additional control modes (such as velocity, streaming commands or Q programming). For these and other functions see other models in the STM17 integrated stepper family . The STM17R-3NE comes with a 1000-line, incremental encoder assembled to the rear shaft of the unit. The A, B and Index (Z) channel signals of this encoder can be connected back to the external controller for position verification and enhanced performance, depending on the features of the controller. To facilitate connecting the encoder signals to your external controller, each motor comes with a 3 ft. extension cable in the box (cable part number 3004-263). A version of the STM17R with just the rear shaft but no encoder is also available, STM17R-3ND, as well as a single-shaft version, STM17R-3NN. 10-pin connector provides the following signals (pin assignments): Ground (1, 2), Index− (3), Index&plus; (4), A− (5), A&plus; (6), +5VDC power (7, 8), B− (9) and B&plus; (10). Power supply requirements: 5 VDC at 56 mA typical, 59 mA max. The encoder’s internal differential line driver (26C31) can source and sink 20 mA at TTL levels. The recommended receiver is industry standard 26C32. Maximum noise immunity is achieved when the differential receiver is terminated with a 110-ohm resistor in series with a .0047 microfarad capacitor placed across each differential pair. The capacitor simply conserves power; otherwise power consumption would increase by approximately 20mA per pair, or 60mA for 3 pairs. If making your own cable to connect the encoder signals to your controller, we recommend using a shielded cable with four or five twisted pairs for improved noise immunity. Max encoder frequency is 100,000 cycles per second. 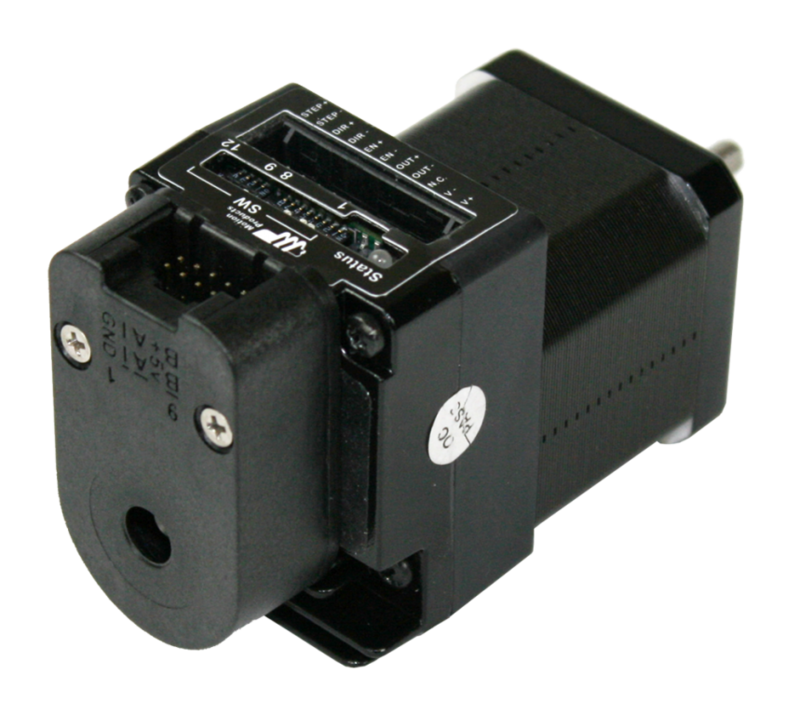 Each STM17R integrated stepper comes with 3 digital inputs and 1 digital output. Two of the digital inputs (labeled STEP and DIR) accept signals of 5-24 VDC and are used for controlling position and velocity of the motor, either via pulse & direction or CW/CCW pulse outputs from an external controller. The third digital input (EN) accepts signals of 5-24 VDC and can be used to enable/disable power to the motor shaft. The digital output (OUT) can be used to indicate drive and motor faults by connecting it to an available digital input on the external controller.